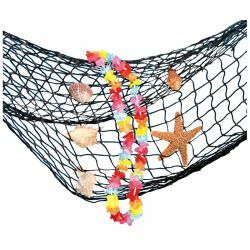 Authentic fish netting that is perfect for decoration for an aquatic themed party or for theatrical productions of the show “The Little Mermaid”. The authentic fish netting is colored as pictured and includes 36” feet of netting. Includes only the netting, flowers, shells, and starfish not included.